Ted Alspach is Group Product Manager, Illustration Products, Adobe Systems, Inc. Barbara Obermeier cowrote Photoshop 6 For Dummies and teaches computer graphics at UC Santa Barbara and Ventura College. PART I: Driving People Crazy -- Illustrator's Bum Rap. 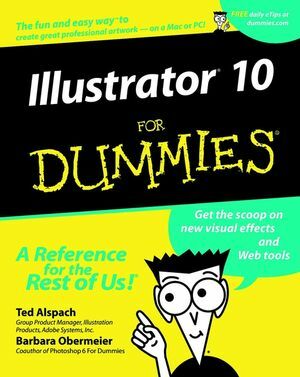 Chapter 1: Introducing the World of Illustrator. Chapter 2: Following the Righteous Path. Chapter 3: Doing Everyday Things with Illustrator. PART II: Drawing and Coloring Your Artwork. Chapter 4: Shaping Up, Basically. Chapter 5: Getting Your Fill of Fills and Strokes. Chapter 6: Selecting and Editing Paths. Chapter 7: Wielding the Mighty Pen Tool. Chapter 8: Wielding the Versatile Pencil, Line Segment, and Arc Tools. Chapter 9: Creating Magnificent Brushstrokes. Chapter 10: Extreme Fills and Strokes. Chapter 11: Keeping Up Appearances, with Style(s). PART III: Taking Your Paths to Obedience School. Chapter 12: Pushing, Pulling, Poking, and Prodding. Chapter 13: Taking Images Out of the Realm of Reality. PART IV: Practically Speaking: Type, Print, and Files. Chapter 15: Introducing Letters and Such (Type 101). Chapter 16: Printing Your Masterpiece. Chapter 17: Putting Your Art on the Web. Chapter 18: Moving Files into and out of Illustrator. Chapter 19: Ten Production-Enhancing Tips. Chapter 20: Ten (Or So) Ways to Customize Illustrator.